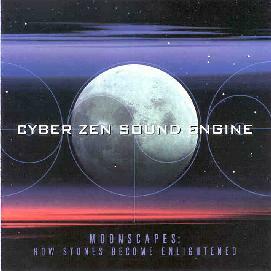 Cyber Zen Sound Engine - "Moonscapes: How Stones Become Enlightened"
This is 99% electronic ambient space music, but not in the sparse wave-ambient style of early Tangerine Dream, utilizing more distinct production, with several great tracks peppered throughout the album (some of which could even qualify as "songs"). Most of the sounds are computer-sequenced for the backdrop but there is also some light improvised synth. CZSE are also a bit different for the ambient field as they don't beat around the arizpheric bush as far as getting into the main theme of a piece: there are few slow quiet fade-ins, so most of the tracks clock in between the 4-5 minute range. The album starts with "All Directions Are Up", which proceeds with a rhythmic pulse, some nice breathy synth and various electronic percussion, the latter of which pops up now and then throughout the album (though as Jerry K would say it's not your typical "floating electronica", taking what it needs from the techno genres and leaving the rest). Following is the album's only piece that breaks the ten-minute mark, "Wind Without Air"; perhaps it could have been a bit shorter, though the guitar tones do shift to a lower register by the end of the track and subtle synth tones abound, so there is progression. "Lucas Somniorum" is definitely a favorite, with its creeping synth pulse thoughout the track, like the sound of an under-water alien chorus, and some more complicated and interesting percussion laid over. Following is "Unexpected Companions", with an even more effective aquatic-synth-creeper underlying the whole piece. The percussive beat here comes closest to the techno approach, but again, not in the danceable mode. Great stuff, though rather short. "Mare Serenetatis" and "The Moon in the Water" both feature very simple but beautiful keyboard-and-piano melodies and sadly wailing synth, and are among my favorites of the disc. "Severed Son" and "One Divine Neuron" are the two tracks with vocals, the former having an extremely depressing mood and the latter having a sample-voice claiming "It isn't lonely at all", though one wonders. The remaining tracks contain similar instrumentation and the same amount of layering but are less notable. Not bad as a debut. Might even be your second coming. You can visit Cyber Zen Sound Engine at their web site, or email them at cyberzense@aol.com. Contact via snail mail c/o N-light-N Records; PO Box 5586; Beaumont, TX 77726-5586.